Ghost Infrared Review | Fat Burner Supplement | Does It Work? 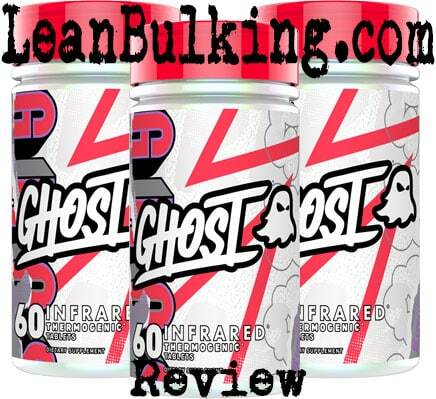 Infrared is a fat burner supplement made by Ghost. It costs $44.99 and comes in 30 serving containers, with a serving size of 2 capsules per day. We prefer daily serving sizes of 3-4 per day - so your body's constantly topped up with key fat burning ingredients to get lean and mean. 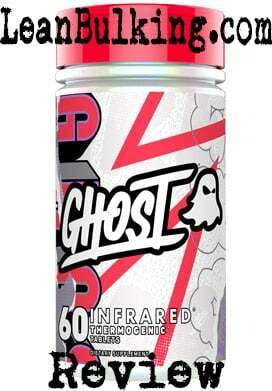 But we must admit, we do like the colourful and funky patterns on Ghost Infrared's container, which makes it stand out from the crowd. Ghost are a supplements company that market gym clothing, caps and hats, to pre-workout supplements and fat burners like Infrared. They're quite a new and cool company that make colourful packaging, like you can see with Ghost Infrared and their pre-workout Ghost Legend. Ghost sponsor some high-level athletes, such as Christian Guzman and Raymond Querido - some big names for a relatively new supplements company. However, apart from that, there wasn't much more information available about this company. So let's take a look at what's under the hood of Ghost Infrared. 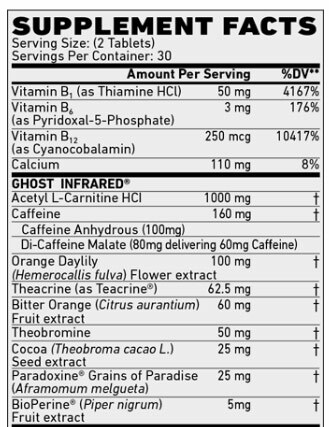 It's a relief to see an ingredient list without any ingredients hidden in proprietary blends - you can see exactly what you're getting with Ghost Infrared (and the dosages of each ingredient), so this is a great start by for Ghost Infrared. However, just from looking at the ingredient list, we can see that there's an overload of stimulants; this can increase your risk of jitters and energy crashes. For this reason, we only recommend taking fat burners that contain Caffeine as the only stimulant inside (Caffeine is proven to be safe and effective, so there's simply no need to add any others). Anyway, we'll take you through each ingredient - so you can see how good Ghost Infrared really is. Also known as ALCAR, it's shown to reduce fatigue and improve focus while also being able to promote fat loss. However, we prefer L-Carnitine in a pre-workout, as it only has a minimal effect on fat loss (it's mainly used to reduce fatigue levels and improve your mind-muscle-connection. But there's no negatives to having ALCAR in Ghost Infrared (as it doesn't cause any side effects). We would've just preferred a muscle pump enhancing ingredient, such as Citrulline Malate. 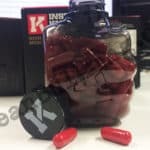 When Caffeine is the only stimulant in a fat burner and in a overall dosage of under 300mg (75mg per capsule), it can give you that 'kick' of energy you need when cutting calories. However, when consumed in large dosages or with other stimulants, Caffeine can cause side effects such as jitters and energy crashes. As Ghost Infrared also contains Di-Caffeine Malate, Bitter Orange Extract (Synphrine), Theobromine and Cocoa Seed Extract (which are all stimulants), you're risk of suffering side effects are quite high. Also known as Hemerocallis Fulva, it's believed to promote fat loss - but it's not been studied enough to be reliable. Not only that, it's not shown to be 100% safe either - so we'll be avoiding this until studies prove that it's safe and effective. This is a stimulant that's believed to be more beneficial than Caffeine - basically, it's thought that humans don't build a tolerance to Caffeine, meaning it's more effective in long-term usage. Although it looks promising, for now (i'm writing this in 2017), there's no proof that it's safe or effective - so we'll be avoiding this too. Also known as Synephrine, this has shown to promote fat loss. However, it's been banned in numerous countries after causing harmful side effects (see side effects section for more info). For this reason, we avoid any supplement containing Bitter Orange Extract to stay safe - we don't want to pay to suffer from side effects. Simply put, this is the stimulant found in Cocoa (chocolate), which can give you slight boosts in energy levels. However, as we've mentioned, as Caffeine is already in Ghost Infrered, there's no need for this to be in this fat burner. All Theobromine is doing, is increasing your risk of suffering from side effects needlessly. Also known as Aframomum Melegueta, this is an african spice, similar to a chilli pepper - for this reason, we believe it'll have a similar effect to such ingredients as Cayenne Powder (raising your metabolism by increasing your body temperature). However, studies haven't shown that Grains of Paradise is effective a promoting fat loss yet. As a result, we'll be sticking with Cayenne Powder for the foreseeable future (why try and fix something that's not broken?). This is the same stuff you put on your food to make it taste better (usually along with salt, although we don't recommend adding salt to your food...). Anyway, this has shown to improve digestion and the absorption rate of other ingredients it's consumed with. Although it's not a key ingredient in any supplement, it can be a great bonus ingredient that works in minimal dosages. The main problems with Ghost Infrared, are the amount of stimulants inside, and the inclusion of Bitter Orange Extract (Synephrine). Basically, consuming too many stimulants at once can lead to you suffering from jitters and energy crashes, which will negatively affect your day. Not only that, Bitter Orange Extract has been banned in numerous countries after causing unwanted side effects (we'll list them below). For these reasons, we recommend only taking fat burners that contain Caffeine as the only stimulant in an overall daily dosage of 300mg, and don't contain any banned substances. Ultimately, Ghost Infrared only contains 1 key fat burning ingredient (Caffeine). 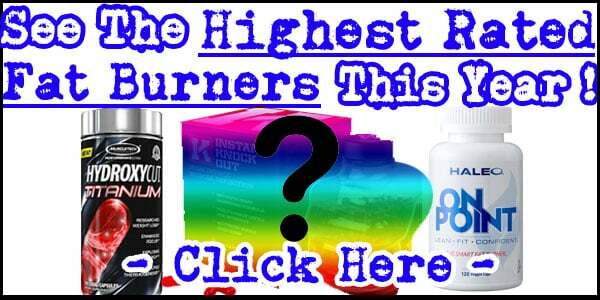 But even this ingredient is ruined by the addition of 4 other stimulants (which increase your risk of suffering from jitters and energy crashes). As a general rule, we stay under overall dosages of 300mg in fat burner supplements - this keeps us safe from side effects while we're able to make the most of Caffeine's energy boosts while cutting calories. We prefer fat burner supplements that contain more efficient ingredients, such as Green Tea Extract and Green Coffee Bean Extract; these have been proven to work and are 100% safe from side effects. Although companies state that ingredients such as Bitter Orange Extract makes their products more 'powerful', it's not worth risking side effects for them - why would you pay for a supplement that could potentially make you ill? Bottom Line: There are fat burners that contain more key ingredients proven to help you shred fat. As a result, we recommend spending your money on those to get more bang for your buck.